Los Angeles is rife with pickup truck owners in that have well and truly forgotten the one and only real reason to own a pickup truck. Not this guy. 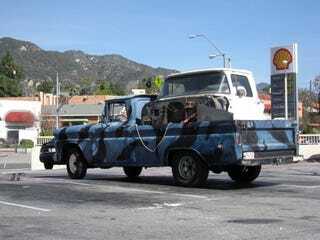 What better to haul around in an old Chevy Apache then another old Chevy Apache? Witnessing this sight at the local OSH parking lot while picking up a padlock served as a reminder that yes, this really is our country.